The axes correspond to the two most relevant axion parameters: the mass, and the strength of its coupling to two photons (more precisely, the dimension-5 pion-like couplings to a photon field strength tensor and the dual tensor). In general, these can be independent parameters; however in particular models they are related. For example, in the KSVZ model - one of the QCD axion models solving the strong CP problem - one has m∼1/f and gaγ∼1/f, where f is the axion symmetry breaking scale. It follows that m and gaγ are proportional to each other, as indicated by the green line in the plot. The yellow band is, roughly, the range predicted by other QCD axion models; therefore it is a natural beacon for axion searches. The CDM2 region in the band is where the QCD axion may account for all of dark matter in the universe. The QCD axion may be the most fascinating dark matter model out there because the parameters have both minimum and maximum values. Some of those values might be challenging to probe, but at least they're a known target, and this investigation will have a definite endpoint. With WIMPs you can keep on hypothesizing smaller interaction cross-sections. We know from the CMB measurements and the Lyman Alpha measurements that dark matter definitely has a rest mass greater than 1 keV, and likely greater than 5 keV. So, axions with rest masses less than 1 keV are not candidates for dark matter. 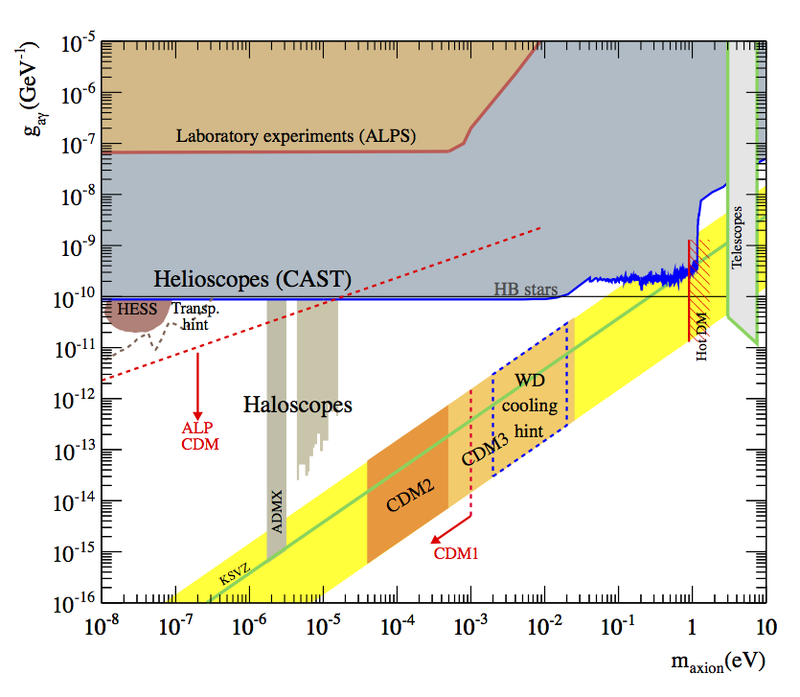 The best fit rest mass for dark matter (as far as Lyman Alpha measurements go) is between 14 keV and 100 keV. See article linked above. The best fit 'thermal rest mass' for a fermion dark matter particle (as far as fitting galaxy rotation curves goes) is on the order of 3 keV. A boson particle with rest mass less than 10 eV is not a viable dark matter particle. These limits on the dark mater mass depend on how it is produced in the early universe. The relic abundance of axions is generated via the vacuum misalignment mechanism, which produces low momentum axions. One can show that QCD axions lighter than ~1 eV behave like cold dark matter from the point of view of the large scale structure. At the end of the day, axions are perfect dark matter candidates, in spite of the tiny mass. There is the bottom of the barrel, and then here is hoping for a miracle in middle earth. It's been a long time, but as I recall, all the cmb can tell you about axions is that if pq symmetry breaking happens below the inflation scale, there may be a possibility of seeing isocurvature perturbations. So isocurvature perturbations would hint at axions, but the absence of them doesn't say anything about axions at all. Of course, things might have moved on since then. Like I said, it's been a long time. It is needed another post summarizing pros and cons of current dark matter candidates: axions, wimps & sterile neutrinos. It's fine and all that axions might start with no momentum, but won't they acquire momentum as they interact with other particles and between themselves. The point of dark matter is that it clumps together in the universe. If an axion has a mass of <10^-5 eV/c2, then it will gain momentum as it gravitationally attracts, and it will soon be relativistic...but this then stops the clumpiness. How does a <10^-5 eV/c2 rest-mass axion remain non-relativistic while it clumps together?